Vrnjačka Banja is the largest and the best-known spa resort in Serbia and has long tradition as a very attractive tourist center for rest and recreation. It is popularly called «The Queen of Serbian Tourism». The development of tourism in Serbia actually started in Vrnjačka Banja already by the end of 19th century when the first guests arrived to this area. The uniqueness of Vrnjačka Banja is that there are seven mineral water springs and each mineral water is different by composition, temperature and medicinal properties. Some of these waters are used for balneo therapy and some as drinking water. All of these different waters have beneficial effects on human health. 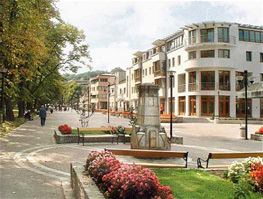 The wider area of Vrnjačka Banja represents the richest and most interesting tourist areas of Serbia. It is where the Middle Ages meet the modern times, at every step. This area has the most significant medieval monuments, especially monasteries with monumental frescos and some of them are protected by UNESCO. Vrnjačka Banja is very well connected to all parts of Serbia by road and railway transport, through the valley of the Zapadna Morava, connecting main roads of the Balkans, Belgrade-Sofia and Belgrade-Athens. Vrnjačka Banja has a long tradition as the health resort. It was discovered by the Romans as far back as 2000 years ago while they were building health resorts for their soldiers. In the period from II to IV century the Romans built AQUAE ORCINAE on Vrnjački hot mineral springs. This fact can be supported by Roman monuments still existing today in Vrnjačka Banja. The history of modern spa at Vrnjačka Banja begun since 1868, when the Establishing founding society of hot mineral water was founded, as the oldest tourist society in the Balkans. Vrnjacka Banja is situated in the central part of Republic of Serbia in Raška District, about 200km south of Belgrade, at 43º37′ latitude, 20º54’ longitude. The spa town is partly situated on the slopes of the Goč Mountain in the direction of river Zapadna Morava and partly in the pleasant valleys of Vrnjačka and Lipovačka rivers. Depending on the position of different city parts, the altitude of Vrnjačka Banja goes from 220 up to 300 meters. The mountainous area of Vrnjacka Banja, with Goč mountain, is a part of large forested mountainous massif of Kopaonik, which is in the background of Vrnjačka Banja. Apart from the mountains Goč (1.147m) and Kopaonik (2.017m) there are other mountains nearby, namely Željin (1.785m), Jastrebac (1.492m) and Stolovi (1.375m). The climate is temperate continental, and the influence of the nearby mountains gives special pleasantness to micro-climate of Vrnjačka Banja. The area of Raška District has great geographic conditions for agricultural production. It contains part of Ibar valley, western slopes of Kopaonik mountain and eastern slopes of Golija mountain. The fertile valleys of Ibar and Morava rivers and the slopes of Kopaonik mountain are the center of agricultural production of Serbia. The largest areas are used for the production of maize, wheat and forage crops. The mountainous regions are covered with rich pastures and meadows, which provides vast potentials for animal husbandry and fruit production.